Families are sure to love staying at Sabbiadoro, which is situated just 200 metres from a stunning sandy beach. While this is a great place for the kids to play, a whole host of first-rate facilities and amenities can also be enjoyed by all on the site. A long stretch of golden coastline is just waiting to be explored by guests and bicycle hire is readily available on the site. Strolling the beach at sunset is a magical experience that should not be missed. 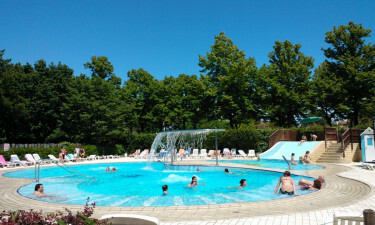 A large water park can be found in the very heart of Sabbiadoro and families can splash around here all year round. While the main pool is large enough to swim laps, there is a separate pool for the little ones and another section that is heated and covered with glass. 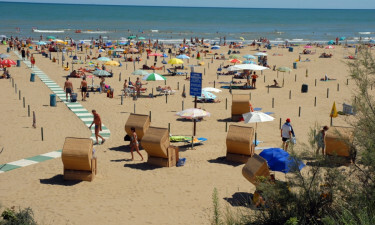 A pretty sandy beach can be reached in just a couple of minutes and guests can prepare a picnic in their mobile home for the family to enjoy on the sand. 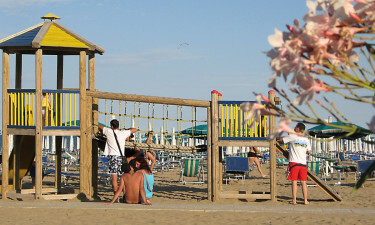 A bar and restaurant connected to the site can be found right on the beach, while means that lovers of luxury camping will never need to wander far in search of refreshment. Book through LuxCamp today.